Atetsu is near Koniya, 4.6 nm away. It is very calm and safe even with a typhoon. As it is well protected with hills, I had an uncanny silence like at a lake in a highland. It is like Aburatsubo port near Tokyo. There are two big buoys of the coast guard, at which you could moor only for a day. 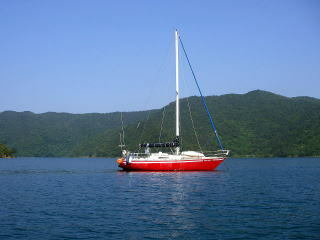 The strong feature of Atetsu is that it is a typhoon heaven where you can leave your boat and go home. 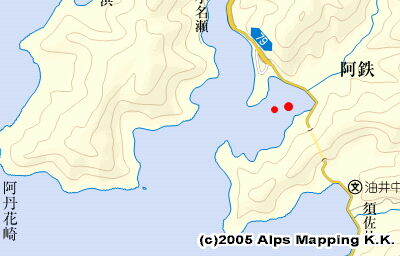 Kasai-san in Koniya put two buoys by himself, at which you can tie up your boat. 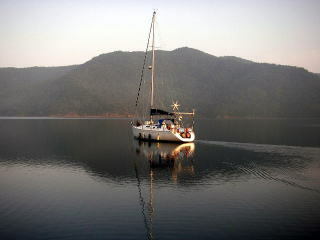 There is also a pontoon at which you can moor for a couple of days short period. Mr. Kasai also made a cottage called Sailors Heaven, which has western style flush toilets, hot showers and a laundry machine. You go to the shore with Kasai-san’s tender. No food shop or restaurant. No convenient. My mobile phone connection was not so good. Here, enjoy the great nature. I stayed there for three weeks. The fee was JPY 1,000 a day. 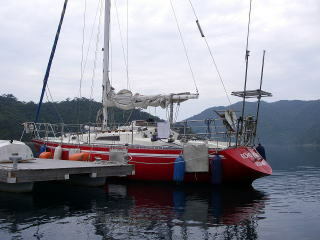 The fee for the facility, such as toilet and shower, at Sailors Heaven was JPY 500 a day.